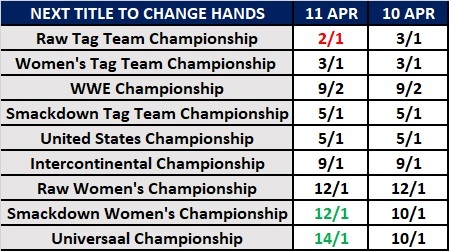 Sky Bet's 'Next Title To Change Hands' market has been taken down as scheduled, so I thought it was worth pointing out some changes that were made to it following last Wednesday's post in which I mentioned it had been refreshed following The Hardys' WWE Smackdown Tag Team Championship triumph over The Usos. When I last wrote about the market, the bookies had joint 3/1 favourites in the Raw and Women's Tag Team Championships. By Thursday, the Raw Tag Team Championship selection had moved in to 2/1. As a result - the Smackdown Women's Championship and Universal Championship were increased. Both were originally as 10/1, but the former went to 12s and the Universal Championship moved to 14/1. On last week's episode of Smackdown, Paige teased that she would bring in a team to challenge The IIconics for the women's tag straps, so I was quite surprised to not have seen that selection move in. With that said, I guess it did make sense to see the Raw Tag Team Championship snipped because it had potential to change hands twenty-four hours before the other. I wrote 'had potential' because tonight's show has apparently had some rewrites due to some stars having trouble getting to Montreal. For example, Zack Ryder tweeted last night that his flight from Newark was cancelled and he had to wait between two and six hours for his luggage to be given back to him. I haven't placed any bets on this market as of the time of writing. This is mainly because I wasn't confident enough to bet against The IIconics because - if I were to have placed a speculative punt - I would have gambled on the second-favourite just in case WWE wants to have Paige's team make an immediate impact. Without knowing for sure who Paige is bringing it made it a pass. Your thoughts on what the big smackdown acquisition will be? If there was a betting market for it, I'd go for a longshot and say Ronda. Do you think Owens will beat Kofi for WWE title? Also I feel McIntyre will beat Seth Rollins for Universal title. There's certainly potential for an Owens heel turn. Haven't really thought about McIntyre/Rollins. I mean i am pretty much expecting Rollins vs McIntyre at money in the bank. I think it's too soon for Styles to be in main title match and that too against Rollins. But would you think it's too soon to have Rollins drop the title considering he's the tier A star on the brand now? Yeah, I too think it's too soon but Brock already had two long title runs. I think a short title run would be fine and just think McIntyre will get a big push. But I can say one thing. The winner of this feud will defend the title against AJ Styles at Summerslam. Who do you think will beat Seth Rollins for Universal title ? I'm hearing rumours of Rollins vs Roman at Wrestlemania. I bet on Styles to be the next Universal Champion last week. Also think that there's a very good chance of Rollins vs Reigns at Mania now that they're apart. Would have still preferred the triple threat with Ambrose, though. For which title do you think Rollins vs Roman will happen ? Okay, so.. if this was any other time, I'd go with whichever title is on Raw so I'd have gone Universal, but now I'd have to say WWE Championship seeing as Smackdown will be treated as the flagship by then.